Come and find Sails and Canvas at Darts Farm – This week our colourful display of handmade marine canvas and upcycled sailcloth products has been given a prime location in this fabulous local retail village, bringing a splash of summer to the home and garden gifts department…and we are sooo excited! 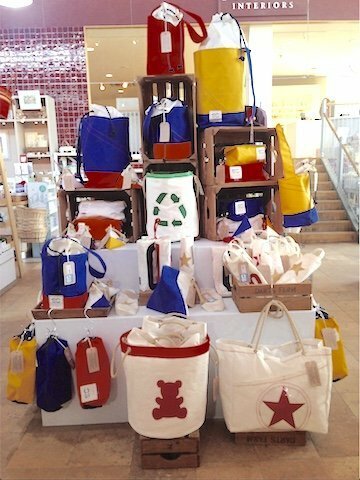 A collection of our best selling items was selected for the display including the recycling, toy and washing buckets and several of our new range which combine canvas and sailcloth to give an interesting twist to the traditional maritime style. It is eye-catching and vibrant showcase and as we handmake everything just down the road on the Topsham quay side, Sails and Canvas is the perfect match for Darts ethos of supporting local independent companies. Darts Farm www.dartsfarm.co.uk was recently voted Best Farm Shop in the UK’ at the National FARMA Awards 2015 and ‘Retailer of the Year’ at the National Farm Business Food and Farming Awards 2015/16 and is a destination store visited by many county wide and beyond each year. It has always championed west country producers, many of whom like ourselves are based in and around Topsham. Our neighbours at Sails and Canvas on the Topsham quayside are Good Game at the Pig and Pallet BBQ restaurant. Good Game www.good-game.co.uk are well established in Darts, not only selling their charcuterie but also with their sausage making courses and demos in the Darts Tepees at last weekends Exeter Food Festival. And earlier in the year our friend Kate de Bass, a Topsham mum, introduced her Pipity activity case www.pipity.com to the children’s department at Darts Farm and it has been a great success. We hope our beach bags, shoppers, duffles, wine bottle holders and washbags will go down a storm…but we are just delighted to be one of several local independent companies being given this wonderful opportunity – Come and find Sails and Canvas at Darts Farm in Topsham, Devon. Proud to support #EarthDay2016…upcycle, less waste helps keep the earth happy! !